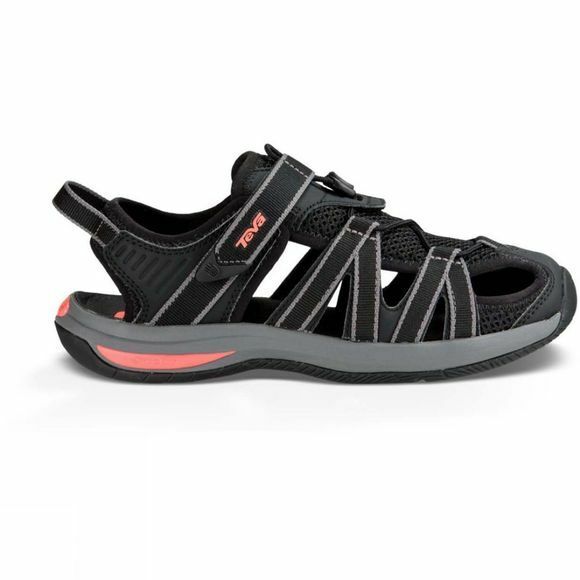 The Women's Rosa Sandal from Teva is possibly the ultimate active woman's sandal. The synthetic upper is durable but with a soft and comfortable feel which allows the bungee lacing system to really help it contour around and hug your foot to get the most comfortable and best fit. A rubber bumper is discreet on the front of the sandal but will provide protection for your toes when out on the trail, in addition to this a soft Shoc Pad in the heel of the shoe will absorb any shock and stop it transferring to your body providing you with extra protection.A nylon shank in the sole unit provides torsional rigidty for stability and control and the Spider Original rubber offers maximum grip in even the wettest environments.